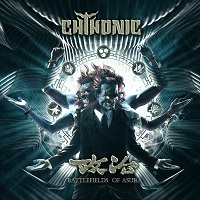 It’s been five years since we last heard a fresh album from the Asia’s strongest metal force CHTHONIC. With “Battlefields of Asura”, it will not just be their comeback, it will also mark Freddy’s name in the history of metal and his country Taiwan as the first rockstar parliament member or national defense and foreign affairs committee. With that, you can understand why you can see “Battlefields of Asura” almost exclusively on every metal magazine’s list of “2018 Most Anticipated Albums” alongside BEHEMOTH, DEICIDE, and many other gigantic names in metal. The album comprises of eleven epic tracks, three of which are instrumentals including the intro and outro. “The Silent One’s Torch” starts the game with a big catchy riff of the intro and Freddy’s monstrous high-and-low screams and growls. The track has lot of orchestral presence, one element that Chthonic has been popularly known for. The layer of sound provided by the orchestrations kind of throws the listener into the song itself, giving them an image of a dark ocean raging in fury. The track also has a very fast pace in terms of the instruments hence also giving it a slight touch of power metal feel. The speed and technicality applied in each and every song is so unrelenting and so energetic that you might find yourself destroying everything around you out of your intense headbanging and solo moshing. There is no exaggeration in that statement, listen to “Flames upon the Weeping” and you will believe me. The intensity is simply too high to not take you away. Also, its anthemnic chorus will keep your closed fist in the air. That again, I will repeat is a side effect of the large power metal feel of the orchestrations. Evidently, epicness and powerful poetry are main assets of this album. The lyrics are mainly about the Taiwanese mythology, and of course, revolution. It is no secret that CHTHONIC is one of the many activist metal groups, doing music for a cause, and they deliver it in a very powerfully emotional way straight in your face. Plus, all the instruments are perfectly leveled to fit with the mood they want to display. Actually, I do believe that this album’s title is its own genre. “Masked Faith” is a two-minute transition instrumental to the gigantic marching rhythms of the song “Carved in Bloodstone” which is the shortest and catchiest song in the record. I hate to compare it to any other song, but I just can’t help but think that the song is the death metal equivalent of SABATON. You know, all the marching rhythms, the catchiness, and choirs. With its catchiness, big hooks and a short but epic solo, this song will surely be a fan-favorite, of course alongside “Millennia”s Faith Undone” which they already released on youtube. Summing up, this is what a perfect comeback sounds like. It can actually come down as the best album they have created. It simply possesses a unique charisma making it so catchy and so anthemic – and the emphasis on the orchestrations are mainly responsible for it. Freddy’s vocal performance is of the highest energy, restlessly and unrelentingly doing eagle howls and lion growls. No words can better describe it other than epic and flawless.